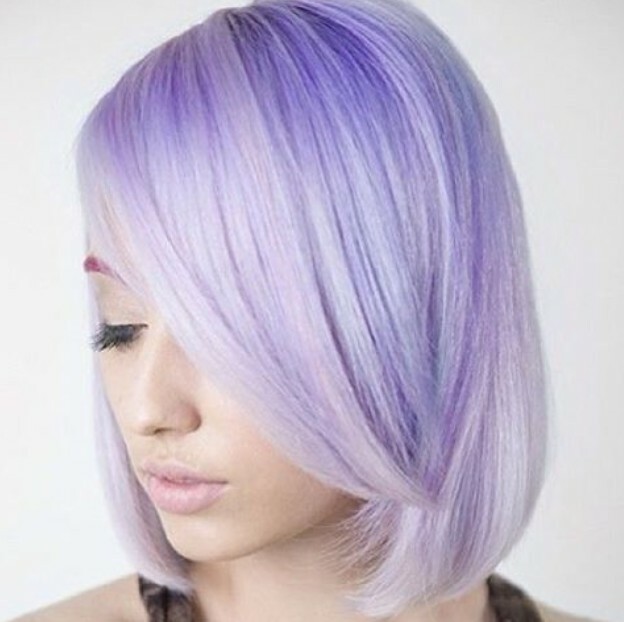 Gorgeous pastel purple hairstyles will sweep the board of hair-fashion awards in 2016! So why not get ahead of the trend with one of these cute, gothic, pretty, edgy and romantic purple hairstyles for spring and summer 2016! The purple hairstyles’ fashion covers a huge range of shades from pale lavender through pinky pastel shades and soft mauves to blue purples! Take a look now and be truly amazed! Pastel purple shades definitely appeal to our dramatic side and this inverted bob hairstyle has choppy, uneven tips to create a ragged finish. 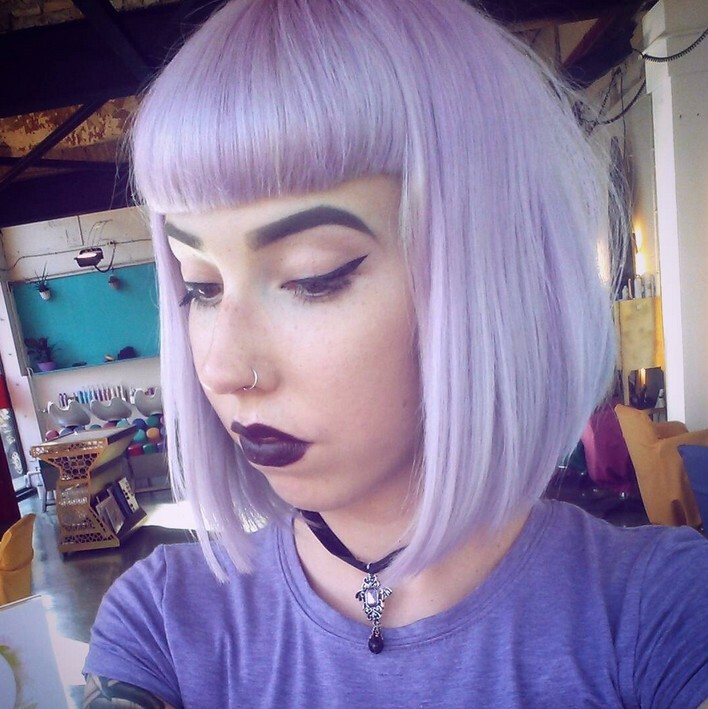 Coupled with the perfectly applied 1950’s style eye-liner and finely painted eyebrows, this purple balayage bob creates a ‘trashed doll’ image. The triple highlights move from pink to pale blue to lavender in a random pattern that creates a deliciously decadent frame around the model’s innocent facial expression. Along with the impressive bat tattoo on the model’s chest, this is a fabulously subversive beauty look! For all-out special occasion glamour, you can’t beat this Hollywood-style long, wavy pastel purple hairstyle! I love the way the stylist has created deep purple roots, which gradually lighten into lavender and then become a softly waved blonde ombré on the ends. It’s a stunning new colour design and one that suits a wavy hairdo, as the glossy hair reflects a thousand different purple and blonde tones. Truly scrumptious! And here’s yet another fashion style that will blow the socks of everyone you meet! Extra-long wavy hair in dual pink and purple highlights – just what you need to be the coolest one of all in any nightclub! It’s a great look if you want to be admitted to the VIP section and make lots of new friends! The shades below include dusky pink and neon purple fading to pale lavender. 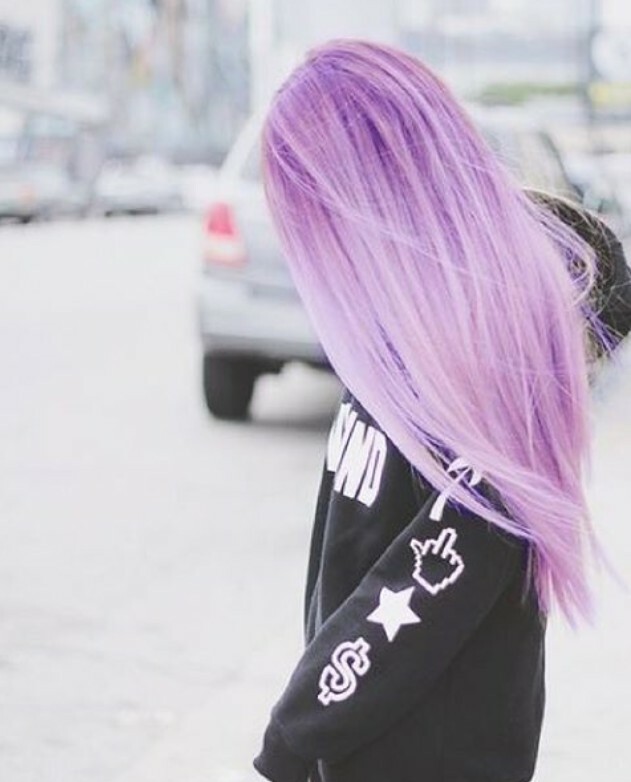 There are currently hundreds of places online to buy instant purple hairstyles in the form of purple hair extensions, making it easy to choose the perfect pastel hairstyles for your skin-tone! 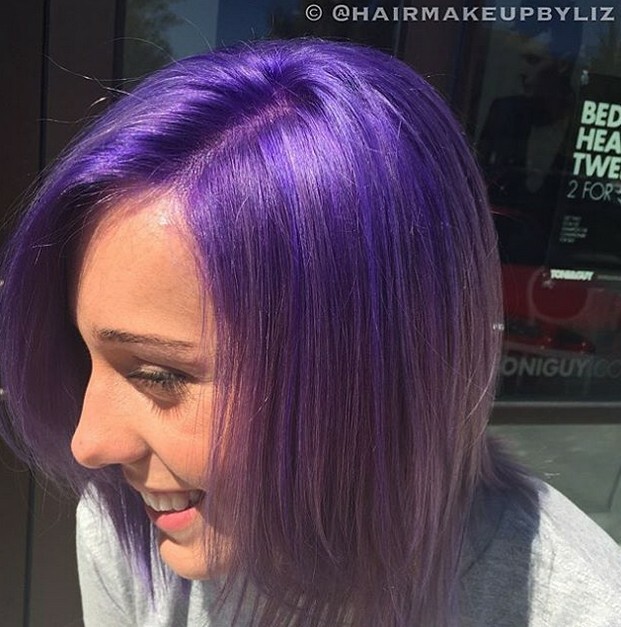 Great for parties and the Next Big Thing in funky hair color ideas for spring and summer 2016! 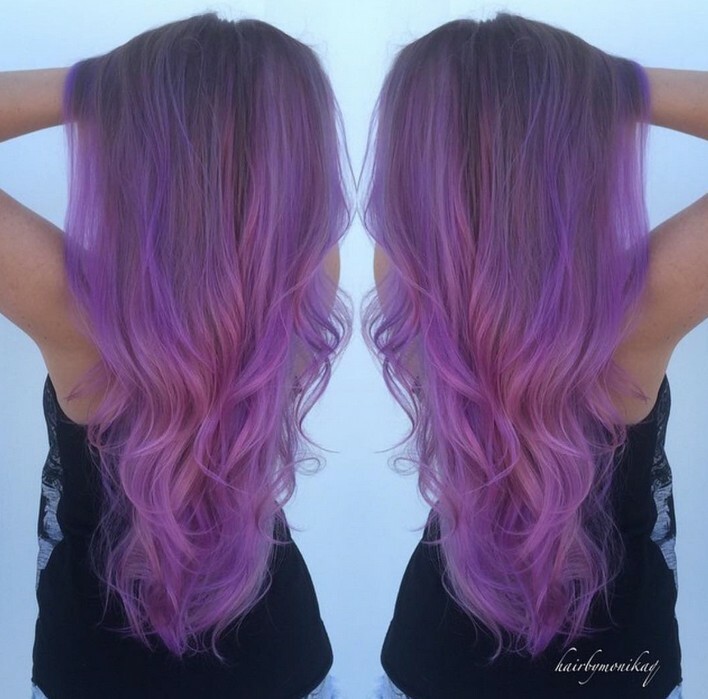 Here’s another amazing purple hairstyles idea on long thick hair with pointed tips. 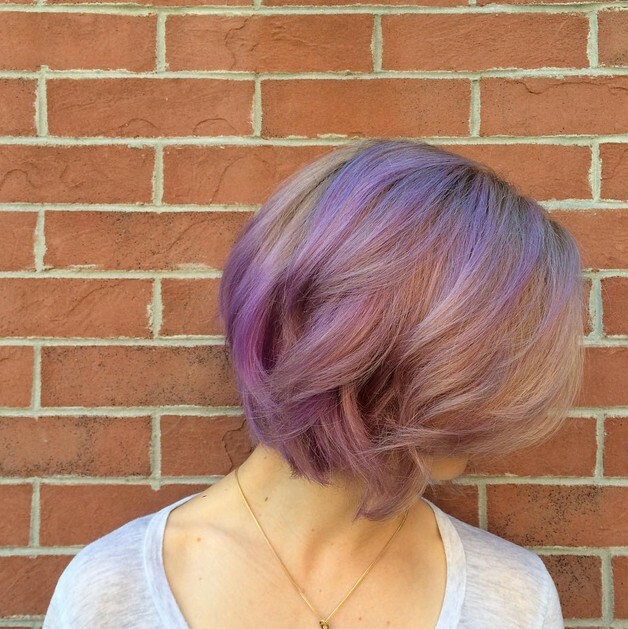 Different shades of purple and pastel highlights create special effects on various areas of the haircut. The lavender pastel highlights around the chin add width to balance out a pointed or narrow chin and accentuate well-shaped lips. 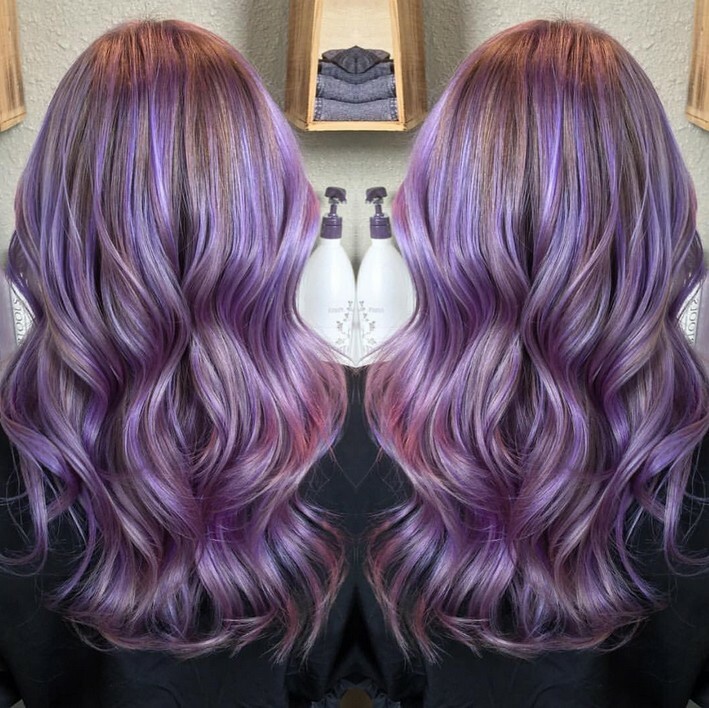 We love the fresh, topsy-turvy hair color ideas, like adding deep purple shades at the ends for dark tips – instead of dark roots. With or without the extravagant drag-queen make-up, this is a lovely way to join the trend for purple hairstyles for spring and summer 2016! 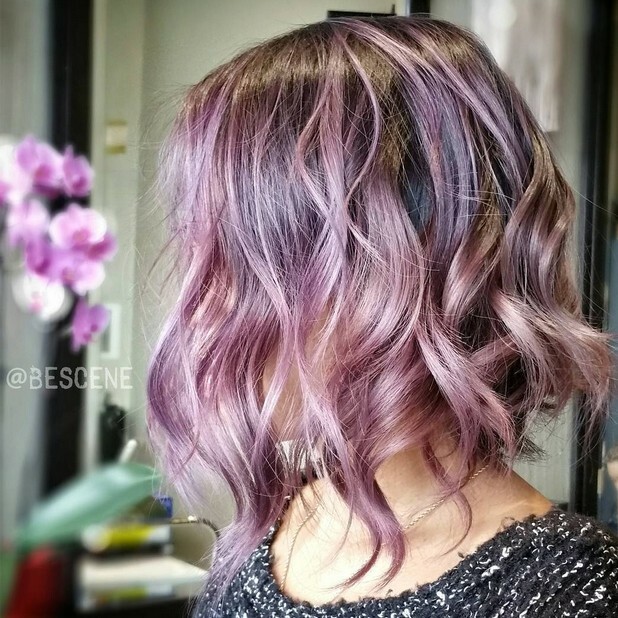 Hairstyles for 2016: This long inverted bob hairstyle on thick hair is transformed into an amazing new look with the romantic lavender highlights. Dark-blonde hair has been lightened to a neutral blonde shade and then pastel pinky-purple highlights added on top. Notice the latest trend for thinned-out, defined ends in the new bob hairstyles, adding an interesting new texture. This gives a fabulous modern twist to the romantic waves, in an amazing hair color idea that would be perfect for a trendy bride, or equally cute for bridesmaids or mother of the bride! This gentle lavender tone softens a platinum-blonde bob hairstyle and adds a more sophisticated finish. This bob hairstyle has been lightly back-combed (teased) at the crown and then pinned up with white hairgrips into a casual, messy updo. Leave the ear-lobes bare to show-off your favorite dangly earrings. This is a great way to keep the nape free of hair and cool in high temperatures. With straight-across bangs and loose smooth strands at the sides, this pastel hairstyle suits a round face shape. And as this hair color idea has a lavender-blue tone with lavender-pink sections, it will complement pale skin with warm undertones. 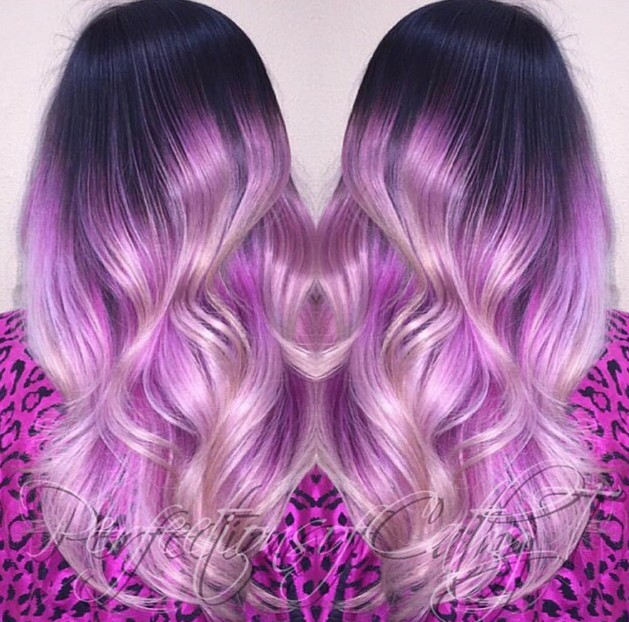 Liven up long, wavy hair with these fantastic purple highlights! Pastel hairstyles will declare your trend-setting style at parties and clubs at any time of the year! 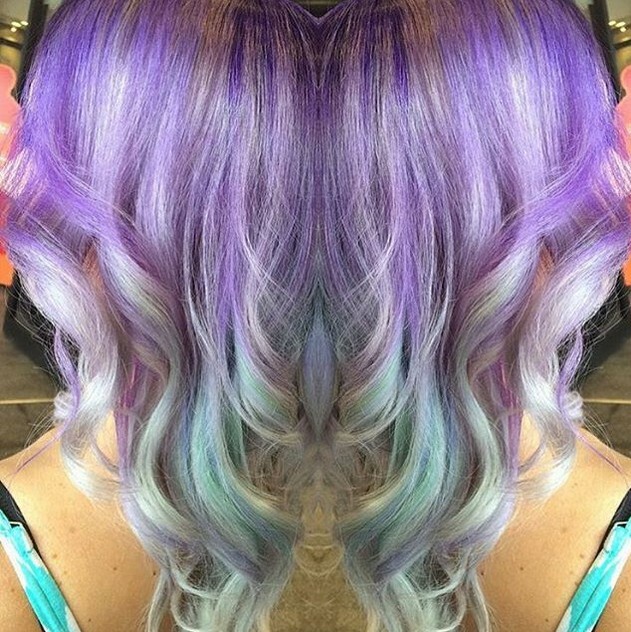 This fab pastel hairstyle shows the amazing 3-D texture you can get with a 3-colour combination of neutral blonde, purple and dark-blonde. And with dark roots still in fashion, you can let the colour grow out naturally for a while, without having to go back for root touch-ups every month! Isn’t it just gorgeous? You may already know this, but certain shades of purple and green are complementary colors on the colour-wheel, so purple hairstyles can really accentuate the colour of green eyes. 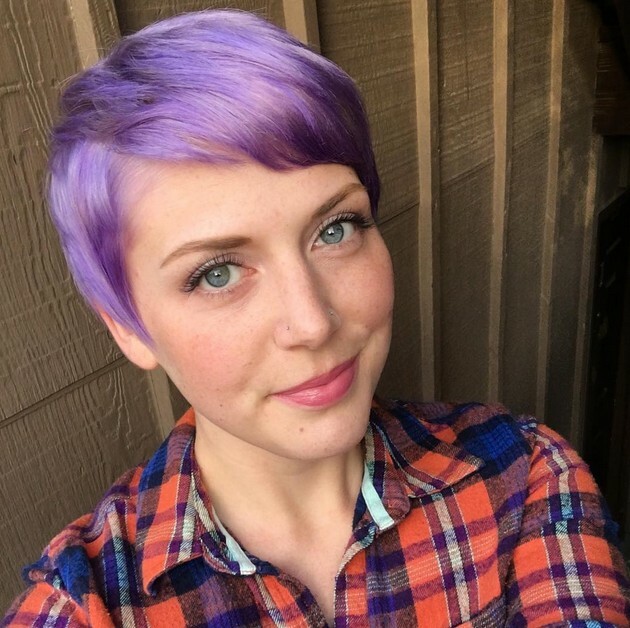 This all-over purple pixie cut is definitely one of the cutest short, pixie haircuts you’ll ever see! It has a modern vibe in the combed forward bangs and blurred side-parting, creating the asymmetrical look that’s totally ‘in’. Notice how the smooth sides end in neat points just below eye-level, so you get a purple frame for the upper face that really shows-off the model’s green eyes! 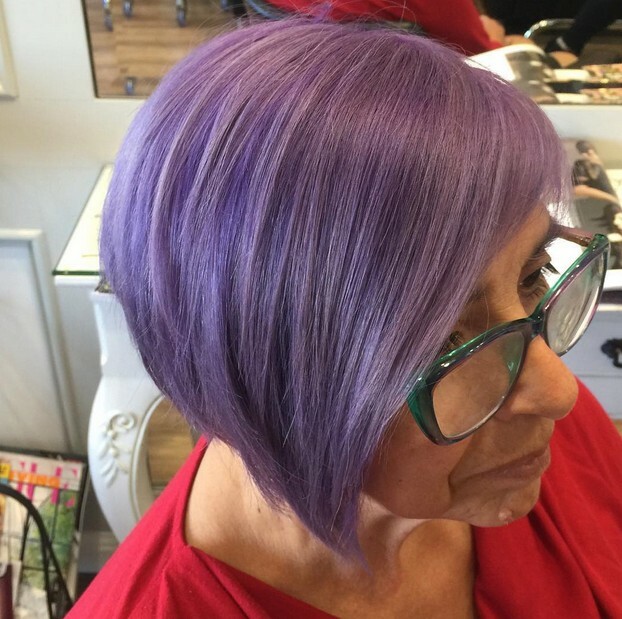 This purple short hairstyle suits an oval or round face and skin with warm undertones. We love the fabulous new hair color ideas that have broken through the ‘natural colors’ barrier and opened up a whole range of new pastel hairstyles! This long and loosely waved inverted bob has a beautiful 4-color balayage, which combines complementary shades of coral pink, blonde, sea-green and purple. Hairstyles like this are a bold and beautiful choice for parties, weddings, nightclubs and wherever you want be with a funky and glam new look! Here’s a romantic, but also chic example of the latest pastel hair color ideas on a simple bob haircut ending just below the ears. The cute asymmetrical braid detail adds a romantic focal point above the forehead and to one side, drawing attention away from a slightly pointed nose. 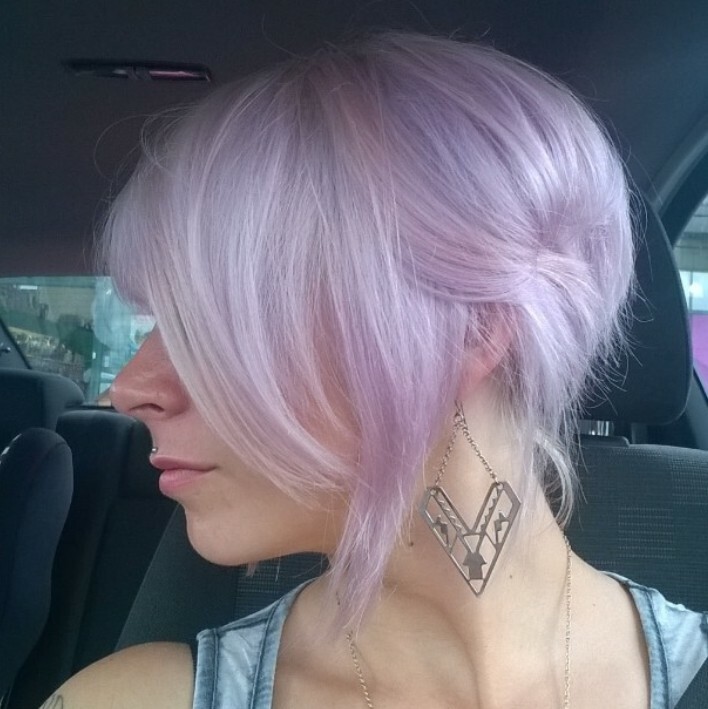 And the lovely lavender-on-blonde hair color softens the whole style in a very attractive way! This short haircut is suitable for fine and medium texture hair and suits oval faces. A couple of months ago, I went clothes shopping and noticed a lot more grey fashion clothes than usual and wondered why. But I know realise this was planned to ensure we have plenty of clothes to match the new hair color ideas – including the avalanche of purple hairstyles! I love how the stylist has gently shifted this edgy, ‘rock chick’ look from platinum with black roots, to groovy charcoal roots and pinky-purple tones over a blonde base. This long bob hairstyle for thick hair has shorter sections around the face to soften the line and a centre parting that really accentuates the funky dark roots! Suits oval or heart-shaped faces. This stylish young woman knows exactly what her style is and has created a modern gothic look to perfection! Instead of dyed black hair, which doesn’t flatter pale complexions, she’s chosen this lovely pastel purple all-over tint. 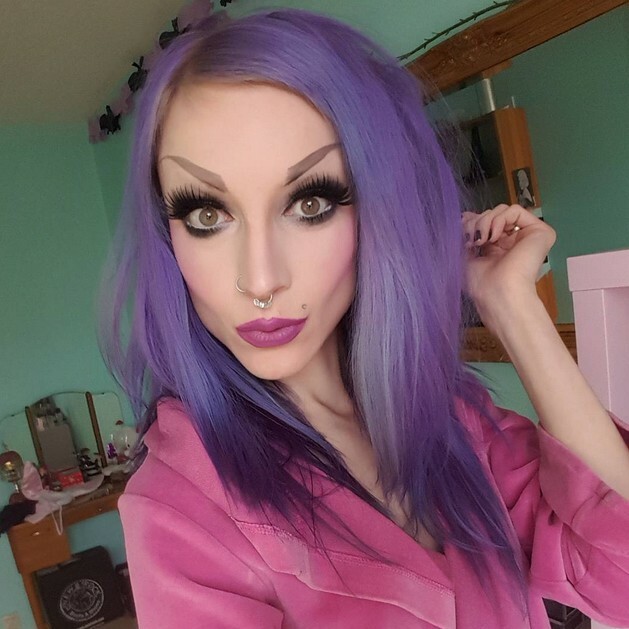 Gothic style’s main colors are usually black, deep-red and purple, but we love this pastel purple Gothic-lite look! It’s very striking. The extra-wide, straight-across fringe (bangs) breaks the symmetry of a round face shape and is cut short to show off strong black eye-brows and eye-liner. The lips are accentuated by a deep purple lipstick and the dark makeup contrasts with the cute, pastel purple on blonde in a funky new hair color idea! For a special party you can’t go wrong with this high-fashion fantasy colour-scheme. It’s a show-stopping long bob cut into a V-shape at the back and curled away from the face. The base is platinum blonde with a carefully applied balayage of purple covering most of the hair and leaving blonde sections as gleaming highlights. 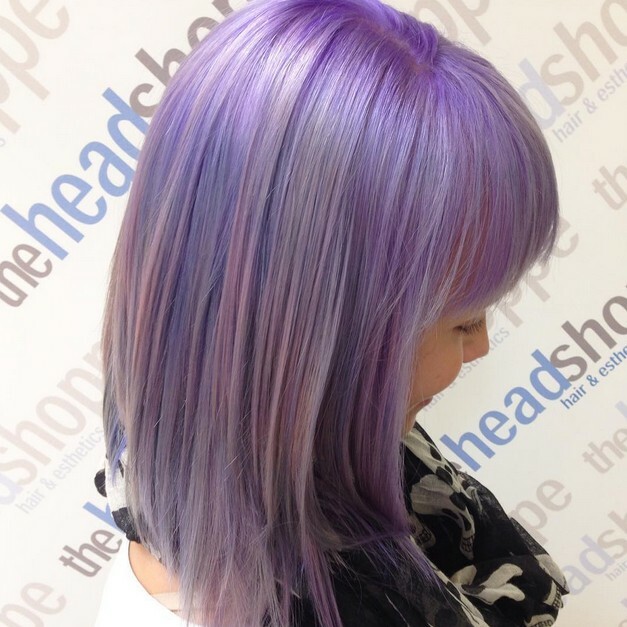 A few inches from the tips, the V back is accentuated with aqua and pastel purple shades. 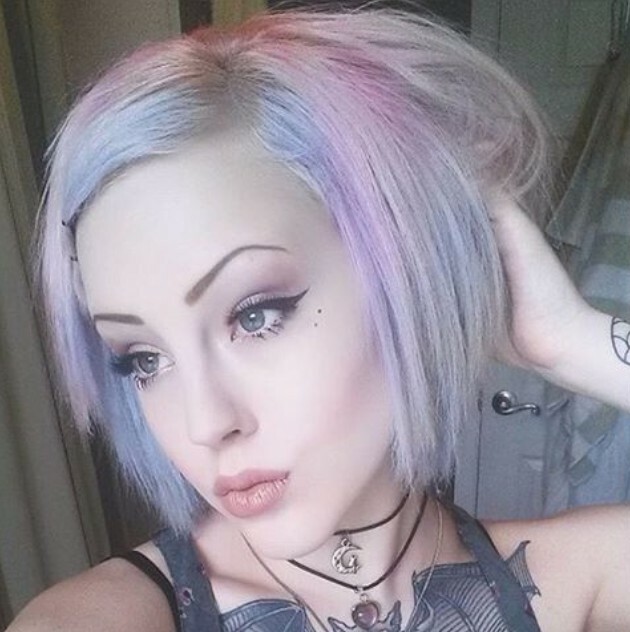 The demand for pastel hairstyles that mimic hair color ideas from cartoons, Manga and online games is growing rapidly and will be very popular for spring and summer 2016! For a more subdued look try one of the hair color ideas that uses dual highlights to create a playful touch of colour on a neutral blonde base. This medium bob hairstyle is an inverted bob with softly draped extra-long bangs and a casual, lightly tousled finish. The colour has been applied in a beautifully-judged balayage of dusky pink and pinky-purple shades, with sections of hair arranged in an interleaved way to suggest waves. This produces a fantastic 3-D colour depth which showcases the relaxed style and colour in this lovely, pastel hairstyle you can wear for any occasion! Transform any long blonde straight hairstyle from a ‘same old’ cliché into a lively, bright new look! 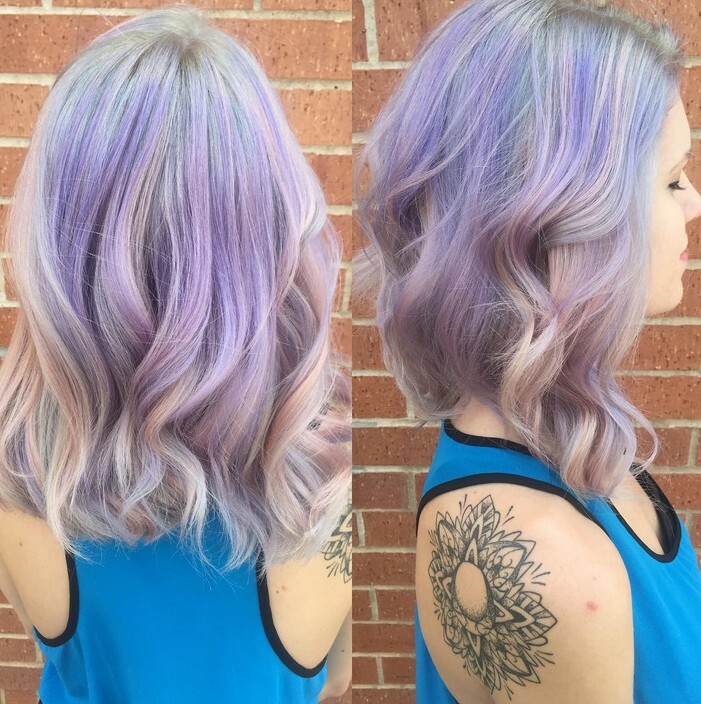 This example of the fabulous pastel hair color ideas for spring and summer 2016 show bands of pastel purple arranged in a dual ombré. 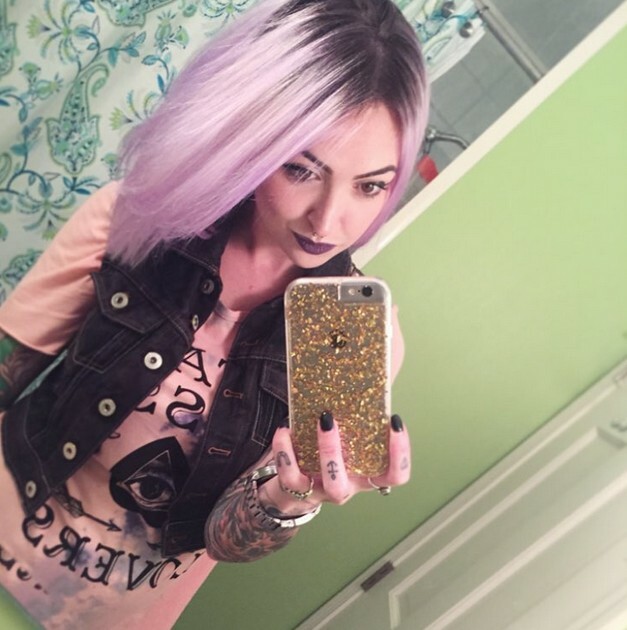 The top band of purple is gradually faded into platinum blonde half-way down the hair shafts, before a second pastel ombré continues to the tips. The effect of this super-cute hair color idea is fabulous on extra-long hair and such a young and trendy look! Here’s how the long, straight pastel hairstyles look from the front, with a centre-parting showing off a perfectly oval face. Purple and pastel hairstyles in mauve, lavender and violet tones with a hint of sea-green, really accentuate brown eyes and create a futuristic look that’s perfect for nightclubbing! 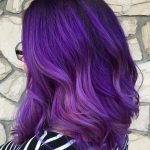 The hair color ideas for 2016 have widened out from purple hairstyles with either highlights or ombré to be any combination of application techniques! The daring hair color ideas for spring and summer 2016 include some wonderfully romantic hair designs, like this cute pastel purple hairstyle. On medium thick hair this smooth bob, with swept-across extra-long bangs, is perfect for a round, long or heart-shaped face. The lavender color’s undertone is pink, which is perfectly complemented by a pale pink lipstick and just a brush of black mascara on the eyes! Hair color ideas for shoulder length hair: We all love our dual or triple highlights and now you can have them with an up-to-date twist – in shades of pink, platinum blonde, aqua and purple! This cute pastel hairstyle is a contemporary long bob with full straight-across bangs that flatters a round, heart or oval face. The 4 shades reflect the light in different ways making hair look thicker and full of interesting texture. It’s a young, fun look that’s perfect for fashion-conscious young women who want to be totally on trend with a lively cut and hair color idea for spring and summer 2016! It’s quite fitting that hairstyles for the over-50’s are showing-off the new pastel hair color ideas, as in the 1960’s it was normal for mature women to have a pink, blue or purple rinse on their hair! Vintage-meets-futurism sums up the fabulously stylish hair color ideas we have for our spring and summer 2016 hairstyles. This style-conscious model has an easy-care medium asymmetrical bobcut with natural gray hair. But with a gorgeous purple shade added on top of her natural colour the effect is youthful, lively and totally up-to-the-minute! 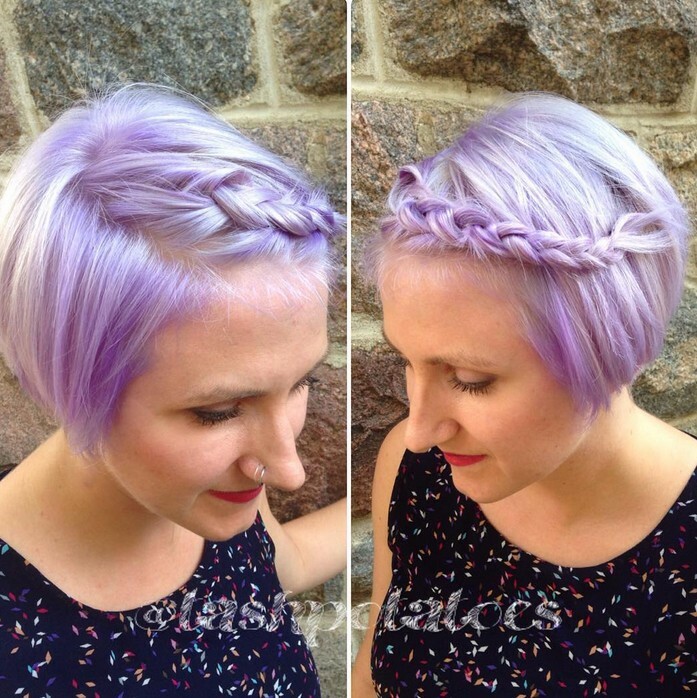 If you need your mom’s permission before you can have one of 2016’s must-have pastel hairstyles, just show her all the gorgeous purple hairstyles on this page! She might like one herself! 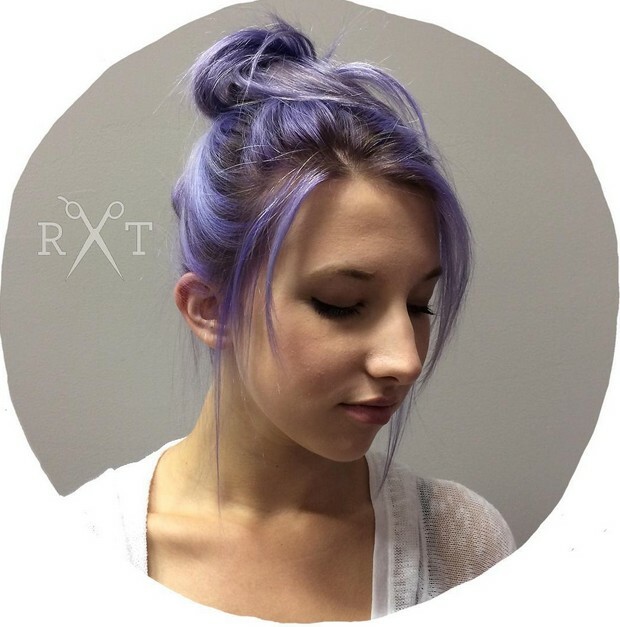 Messy updo’s are perfect for teens who want to look super-casual, and with a cute temporary purple rinse over a dark-blonde natural color, you’ll look edgy and futuristic for your prom, beach holiday or wherever you go! This messy, purple updo with sharply textured tips is a bit Manga – a bit cyberpunk and very individual. This pastel hairstyle suits oval, round and heart faces and the blue-purple shade is set to be one of the major hair color ideas for spring and summer 2016 hairstyles! Here’s my final fabulous hair color ideas pic for today and it’s a stunning mid-purple pastel hairstyle to suit an oval, round or heart face. Vivid purple shades are suitable for a warm skin tone like the model’s, as your hair color shouldn’t drain all the color out of your complexion. To offset the vivid purple, the hairstyle is very simple and smooth with an off-centre parting and shorter lengths around the chin to soften the line. The colour fades gradually into a neutral blonde shade and the ends have been thinned and given sharply textured tips to add a nice touch of contrasting texture to the smoothness above! Notice how pastel purple hairstyles go very well with turquoise/aqua highlights, green eyes and green spectacle frames in the photos above. You wouldn’t think of green as a mix and match colour for purple, but actually they do complement each other as opposites on the color wheel. 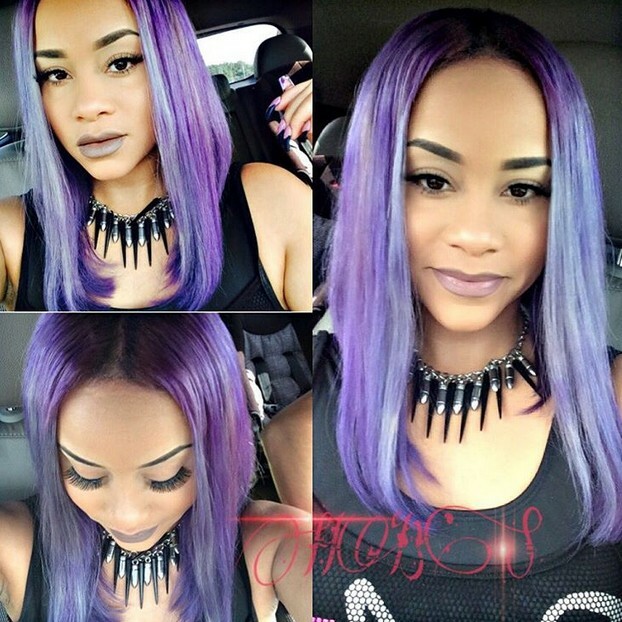 So which of these gorgeous purple hairstyles and hair color ideas are you going to try first? 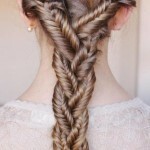 Why not find more latest cool hairstyles on Hairstyles Weekly?